Jared is the champion of volunteering. Every year he donates countless hours, well into the hundreds, giving his time, his ideas, and his drive to the organizations he loves. Today, he shares his story with us. I Rolled a Life Changing 20 and You Can Too. Four years ago, my second book “Changing Wax” was published. I had accomplished my lifelong dream, and no one had any idea who I was. Getting published was a massive struggle that took nine years to happen, and I was exhausted. Antsy to do something, but not ready to take on another book, I had an epiphany. I would use my knowledge and experience to make it my mission to help people achieve their dreams. I had no idea what that single decision would lead to. After talking it through with my wife and we figured out that I could volunteer a couple hours a week. I went out looking for ways to get involved. Which was not nearly as easy as it sounded. I stumbled into my first opportunity after taking a shot in the dark and emailing the Mayor of West Jordan. Mayor Rolfe recommend that I join the West Jordan Arts Council. Shortly after I was appointed to the West Jordan Arts Council by the West Jordan city council. Serving on the Literary Committee under an amazing Literary Arts Chair John Pulver, I started to learn the ropes on how to do more in the community. At the exact same time this was happening I met Johnny Worthen who recommend that I check out the League of Utah Writers. During my very first meeting with the Oquirrh Chapter it was announced by Chapter President Eliza Crosby that they needed a new Vice President, after a massive internal debate (and texts from my wife encouraging me to volunteer), I volunteered. Under Eliza, I was starting to learn about how the League worked and what things I could do to help. I worked on a few projects with the Arts Council and the League which embolden me to find some additional small projects. I volunteered to help author David Armstrong at the Davis County Fair, volunteered to help acclaimed artist Roger Whiting at the DIY Festival, helped staff the League table at LTUE and Storymakers. I started to figure out how much time I could spend on projects and started to figure out how to better utilize the resources I have access to. Fast forward to today, after dozens and dozens of projects, and events, I am now on five non-profit boards (League of Utah Writers, Storymakers, Cultural Arts Society of West Jordan, Eagle Mountain Arts Alliance, and Big World Network), I work four jobs (VLCM, Lyft, Real Salt Lake, and being an author), and spend time with my wife and five kids. My mission transformed into a passion, and then into a dream. I get to help people every day reach their dreams. As you can see, I didn’t get into volunteering to gain position or rewards other than seeing people succeed. However, I discovered that volunteering selflessly was like rolling a 20-sided dice over and over. The number would randomly throw unexpected rewards. The key being that the service had to be selfless. Like a waking dream I found myself sitting in front of hundreds of people at the LTUE conference 2019. I was sitting off to the side waiting for my turn to be a special guest with the Writing Excuses Podcast. I had rolled a 20, and I was being honored with a tremendous opportunity. I knew however, that even in this moment, it wasn’t about me, it was an opportunity to help others find ways to figure out what I had found out. I watch as special guest Natasha Ence and Rosalyn Collings Eves, do an amazing job on the podcast. Then it was my turn to sit with the amazing team of Brandon Sanderson, Dan Wells, Mary Robinette Kowal, and Howard Tayler. We talked about volunteering and ways to find opportunities to volunteer. It was amazing. When people had found out that I had selected to be on Writing Excuses, everyone asked how I had accomplished such a thing. I told people that I wasn’t sure, but I was honored to have such an opportunity, and talk about selflessly volunteering. Everyday I wake up and live my dream of helping people. If you add the goal, mission or passion of helping people by volunteering (not just in the writing community), you will be rolling a 20 side dice that will change your life. It will help you accomplish amazing things and give you opportunities beyond your imagination. I have to thank all the amazing people for giving me the chance to volunteer and taking a chance on me. You just have to take a chance on yourself and volunteer. I would love to see you out there. Jared Quan is a video game addict and writer published in genres from Spy-Thriller to Horror/Supernatural, to Fantasy-Comedy. His work includes Ezekial’s Gun, Changing Wax, Classified, Pathological Passion, (Futuristic/Romance/Steampunk, which he co-wrote with his wife), Unclassified, and Prepped (a story in the Apocalypse Utah anthology). He has extensively served the community in roles from the President for the League of Utah Writers, Board Member of the Cultural Arts Society of West Jordan, Grants Director of the Eagle Mountain Arts Alliance, Executive Director of Big World Network, Chair of the West Jordan Arts Council, serving on the Utah Poet Laureate Selection Committee, Recruiting Chair of the Association of IT Professional Utah Chapter, as well as serving as a general volunteer for countless events and organizations. Jared was given the Gold Volunteer Service Award by the President of the United States for his over 1,500 hours of service to the writing community from 2015 to 2017. He has also received recognition and awards from the Governor and Lt. Governor of Utah for his volunteering. Want to connect? It’s easy! Tales of wise, ancient dragons hoarding treasure, terrorizing villages, and doing battle with noble heroes have long fascinated us. But dragons were not born old and wise, nor were heroes born brave and noble.Wings of Change gathers tales of young dragons growing into their scales and claws, and human youths making choices that shape their destinies – destinies that will be forever changed by their interaction with the dragons that share their world. My story “Saffron Dragon” is about a blind Bangladeshi girl who discovers a dragon lives in her dreams. She must learn to both trust herself and the dragon to find her place in the world. Wings of Change is available in both print and ebook on Amazon. Around these parts, writers are drawn to writing conferences more readily and faster than cats chasing a laser pointer. For those of us who have been around for a few years, a writing conference is a great excuse to hang out with our awesome writer friends and claim it as a business expense. For newer writers, a writing conference is a place to find new friends and feel supported all while learning the tricks of the trade. 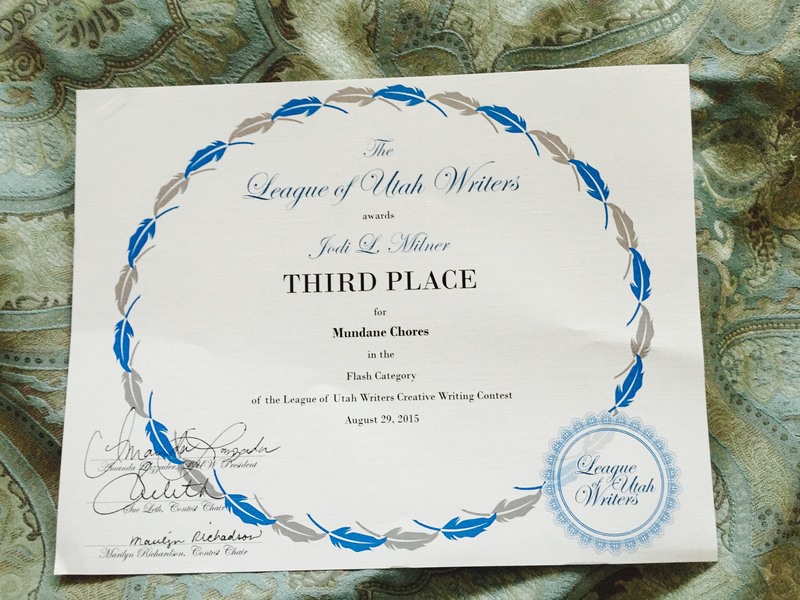 The League of Utah writers held their annual conference October 6-7. Even better, they let me come play. I got to moderate a panel titled “Mindfulness and the Modern Author” where we explored the importance of finding your center and using mindfulness techniques to acheive greater focus and more importantly, get more and better words on the page. On the panel with me were Jef Huntsman, Peggy Eddleman, Lauri Schoenfeld, Amanda Luzzader, and Dan Allen. If you are nice to me, I might do a blog post about the key points in the future. One of the other perks once you’ve been around for a while is the chance to volunteer. On a whim I asked to help out and the next thing I knew, I was in charge of the special guest check-ins in the green room. Major Score. I got to spend the majority of my conference doing what I like best, having conversations with some of my favorite local authors, including our keynote Kevin J Anderson. I also had access to the best snacks. While I didn’t get to go to as many classes as I would have liked, I did get to go to a few. DK Godard did an amazing presentation on the use of ballistics gel and let us play with some that he brought. Liesl Seborg taught about how authors can get involved with their local libraries, Patrick Tracy did a mini workshop on flash fiction and let us play with some random generated story prompts. I wrote a story about an astronaut waking up from a medical hypersleep and being hit on by an alien who thinks he’s cute. He rejects her because he’s still tired. I might just post it here if I get brave enough. There was also an insightful lecture given by John Patten about leadership for those in the league in leadership positions, including myself, one of their chapter presidents. All in all, a terrific conference, fabulous guests, good food, and good memories. The 2017 Utah writing conference season kicks off with the ever popular, and oh-so-affordable “Life, the Universe, and Everything” symposium on science fiction and fantasy. I’ve attended this particular conference a handful of times as a hopeful starry-eyed participant in the past. However, this year for the first time ever, they let me play with the big kids. That’s right, yours truly got to be an expert panelist. If that wasn’t exciting enough, I got to be a panel moderator as well, which is a huge first. It’s hard not to read too deeply into the committee’s choice to include me, a mere short storyist. My qualifications as an author are still a bit thin. There are so many super talented and super published authors in Utah that you can’t throw a rock without hitting one. I’d love to say I was picked because they had seen some of my presentation work before and they were impressed. The truth is, I apparently have in-depth knowledge of several obscure fields of study, knowledge that most gals in my position don’t have. I also volunteered to be part of several obscure panels. My first panel discussed the realities of what happens at death. I haven’t personally died yet, so my experience is limited there. I’m holding off on trying it out until it goes on sale. Instead, I have worked in health care for both humans and animals and seen plenty of death that way. My fellow panelists included a firefighter, a seasoned RN and personal friend, a physicians assistant obsessed with cellular biology, and the moderator who I still haven’t figured out the background on. In fairness, he’s still puzzling out mine. The other panel centered on the visual comedy of Rowan Atkinson. I know, I laughed too. death goes so well with visual comedy. On the panel was the founder of the LTUE conference itself, Dave Doering, and the TMA track head, Nick Mills, and another guy who apparently spent his childhood the precisely the same way I spent mine, watching late night PBS when all the British comedies came on. Yes, I didn’t have that many friends, why do you ask? Needless to say, having two fairly influential people on the panel stressed me out to no end. To sum up – I had a great time and I believe that my panels went well. I wanted to attend a few other panels and perhaps glean a few nuggets of new writerly wisdom, but instead I hung around with writing friends instead, which honestly is the best part of the conference anyway. A huge shout out to the following awesome people who let me play and were kind enough to let me hang out with them: Jared Quan, President of the League of Utah Writers; Candace Thomas, Eliza Crosby (who got a full manuscript request – you go girl! ), Sarah Seeley, Chris Roche, DawnRay Ammon, Jenna Eatough, and all my other LTUE talented friends! Don’t miss out! Followers get all the latest updates and interesting tidbits. Don’t like following blogs? Not a WordPress patron? That’s okay. You can get all the latest, and more, by hitting “Like” on my Facebook author page.